Memorials are paradoxical structures. Often they are outstanding examples of creativity, but they owe their existence to tragedy. In recent times a memorial industry has emerged. Lutyens’ Cenotaph in London has at least nine monuments within walking distance, constructed in the last two decades. And in the last two months, Daniel Libeskind’s National Holocaust Memorial opened in Ottawa, David Adjaye and Ron Arad won the competition for its London equivalent, and Frank Gehry’s controversial memorial for President Dwight D Eisenhower broke ground in Washington DC. Such high profile projects raise questions about the design values, integrity and even necessity of memorials – especially those which seek to cement the originator’s legacy. What makes the Cenotaph, or Carmody Groarke’s 7/7 memorial, an architectural success, but others nearby a failure? It is at least partly context, sympathy with the landscape, well designed lettering, sensitive use of materials. 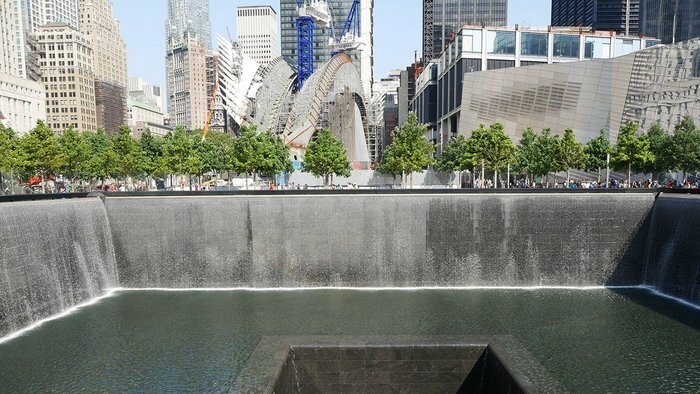 And given their unique function, memorials also require a nuanced understanding of emotional subtleties and complexities. Must architects distance themselves from the tragic histories of such projects in order to achieve clarity of vision? Studio Libeskind led on both the Canadian monument and Ground Zero, and its CEO Carla Swickerath’s answer is a definite No. ‘Memorial ­architecture should not be led by an abstract or neutral hand but with the heart,’ she says, pointing out that Libeskind’s own experience, as the child of Holocaust survivors, is fundamental to his work. The Ottawa monument is an experiential space. It is an abstract Star of David made up of triangular concrete volumes representing the badges Nazis used to identify and shame their victims. On the walls are large scale monochrome photographs of Holocaust sites taken by Canadian artist Edward Burtynsky. Two ground planes establish a circular direction of travel – one travelling down to contemplative spaces and another leading up, to the future. Above a central interpretation space is the ‘Sky Void’ with the eternally burning Flame of Remembrance. The Stair of Hope leads to a plaza overlooking the Parliament buildings and Ottawa’s Peace Tower. Evergreen trees represent the descendants of survivors and their growing contribution to Canada. While this deliberately constructed, overtly named symbolism is not to all tastes, Swickerath explains that these meaningful elements evolved organically in the design process, which all parties approached with ‘sincerity not cynicism’. The aim is to elicit both ‘intellectual responses and feelings… evoking memories through physicality’. Lettering artist Mark Frith, who has worked on some of the UK’s most remarkable monuments, says: ‘We all have a common understanding of love and loss. Emotions that are evident form part of the brief, part of the source’. The key is to identify and harness those which are fruitful in conveying an ‘onward message of hope’. The same philosophies for designing a private memorial also apply to public works. Those who have buried their own dead will understand: in the time between commissioning, design, and eventually setting a headstone (around a year before the ground is ready) the memorial’s function subtly shifts. It initially identifies the deceased individual, then becomes a memento of the bereaved relative’s emotional journey too, and eventually offers comfort in achievement. A memorial is never about one person but about a network of relationships. ‘With any loss there are conflicting feelings such as anger. A memorial should go beyond that. We are designing for the living,’ says Frith. Rachel Whiteread’s Nameless Library at Judenplatz, Vienna, is a concrete cast of a hermetically sealed room. Before the Chernobyl explosion – which killed 31 people immediately but exposed countless others to radiation, displaced thousands and left whole settlements abandoned – Belarusians experienced many tragedies, including during the Nazi occupation when worshippers were locked in wooden churches and burnt down. Keen not to focus on such atrocities but driven to subtly pay homage within his designs, So made use of interior lighting. At night, the simple modern wooden chapel glows like a lantern. It is a beacon of hope rather than tragedy. So hopes the child­ren of the community will – in the future – identify the church not with the tragedies of their parents’ generation, but rather with new memories of friends congregating in a building filled with light and the smell of timber. So also notes that his Belarusian clients tend to view their past as a history of ­emotions, rather than as a series of events. Emotional intelligence is perhaps too often disregarded in architectural training in favour of abstract intellectual reasoning. ‘A design that would win architects over does not necessarily move peoples’ hearts,’ he suggests. 3RW’s The Clearing in Utøya, Norway remembers the victims of the 2011 massacre with 12m diameter circle with names inscribed on it. everent visitor responses to a spontaneous memorial, in the immediate aftermath of a terror event for instance. Such popular expressions of grief are the result of an outpouring of emotion where there has been no time for the ground to settle, and their temporary nature renders them all the more poignant. So for memorial architecture to help communities achieve closure, it should probably rethink the idea of permanence too. Consider two contrasting projects in Utøya, Norway. In June, the Norwegian government controversially cancelled artist Jonas Dahlberg’s competition winning entry for a memorial to the victims of Anders Behring Breivik’s 2011 massacre, after disapproval from local residents and victims’ families. His ‘memory wound’ proposal was a landscape intervention cutting an irreversible 3.5m slice through the Sørbråten peninsula. A perpetual reminder of the trauma and an all too literal embodiment of the scars and social divisions exacted by Breivik’s crimes. Clearing Memorial by 3RW, near the site itself, is the ideological opposite. Here, a ring is suspended from pine trees. The victims’ names are cut out of steel, through which sunlight and plants cast dappled shadows. A visitor can see the forest, sea, and the coast at Sørbråten from the circle. According to the 3RW: ‘The high level of social trust and sense of community was challenged and even met with criticism [after the attack]. In light of this, we propose a landscape-friendly memorial, built through volunteer work and community – the true spirit of the Norwegian society.’ This community work, known as ‘Dugnad’, is intrinsic to the memorial, as it often takes place with the changing of the seasons. According to 3RW ‘the memorial at Utøya should show the nature that slowly changes time and memories’. So memorials which do not appropriately navigate the emotional environment are set to fail. Too theoretical and the monument is cold, unforgiving or confrontational. Driven by popular sentiment and the result is mawkish or kitsch. And imperialistic, grandiose memorials (which still crop up in Royal Parks) generate resentment. Successful memorials do not need to make a loud statement, but they do need to demonstrate a lack of ego and an awareness that while honouring the dead, the structure must be emotionally honest with the living.